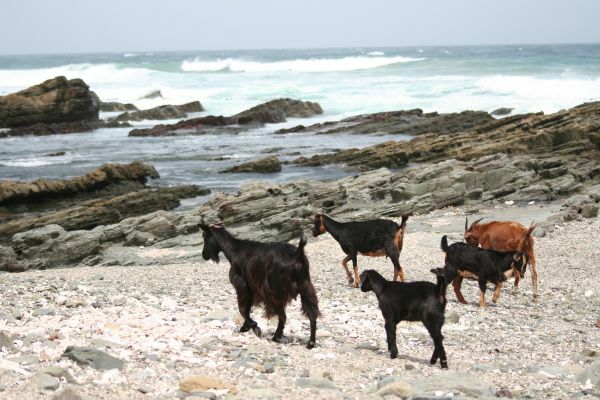 The Wild Coast was known as the Transkei during the Apartheid era and was treated as a “Homelands” area by the regime – designed to be an area populated by black africans. The regime sought to make it independent, to be ruled by a king from the local capital, Mthatha – however, this model was never acceptable to the ANC. It is a very large rural area, with villages made up of 5 tribes of “Khosa” people. We got the opportunity to learn a bit more and experience some of the culture during our days here! Back to the coast! One night at Chintsa quickly turned to two when we heard that our next destination had no TV to watch the Rugby World Cup Final! We made a good decision – had a traditional Khosa meal and enjoyed the obviously enthusiastic atmosphere for the match. English supporters generally remained pretty quiet! The aftermath of the South African win through up some interesting issues. 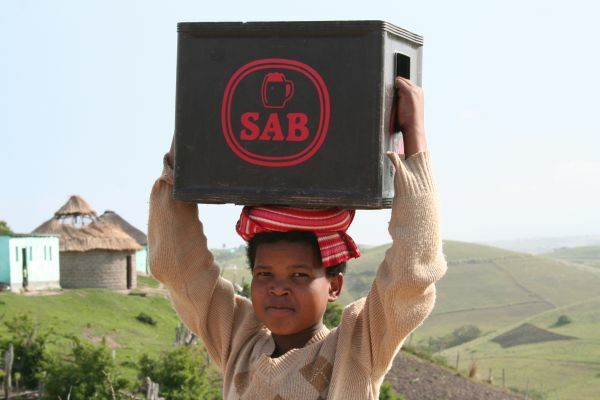 In the post apartheid era, there is a quota system which operates in business, requiring them to employ a certain number of blacks, whites, coloureds and indians – regardless of suitability or qualification. This can create obvious practical difficulties. However, the proposal is now that the quota system would also apply to the Springboks team – again, rather than being chosen on a talent basis. This was why the coach, Jake White, quit in the aftermath. The general view is that if the system is introduced, it will be a long time before we see the Springboks win again. 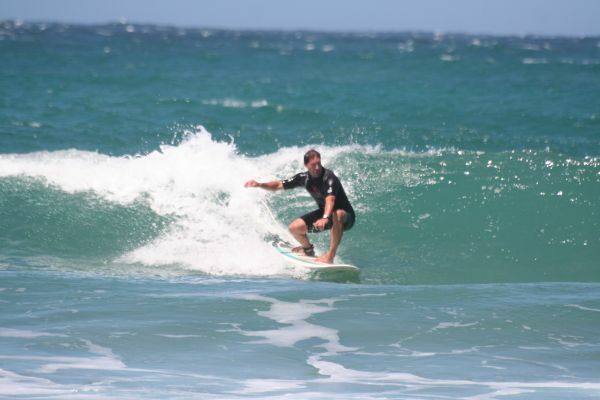 Our trip to Chintsa, despite its beautiful coastal location, did not lend itself to surfing…too windy! We did a “cultural” mountain biking trip with a local guide, who took us to meet Mama Tofu in a local village. 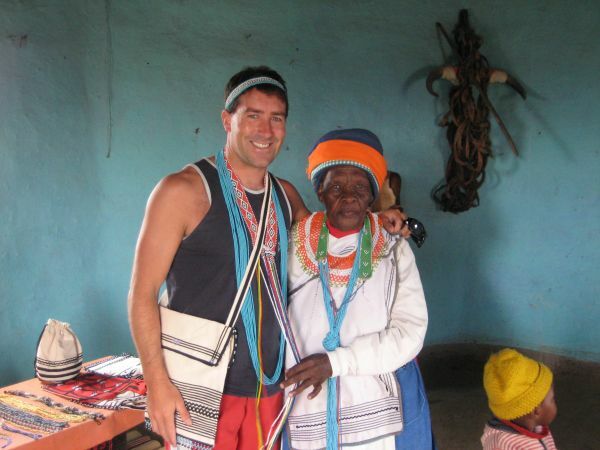 This very capable and eloquent 87 year old local lady had started her tourism business – introducing the likes of us to the Khosa culture (Nelson Mandela is Khosa). Not much has changed in the last couple of hundred years. I was proclaimed of marriagable status when I successfully ground some corn! The old world image was thrown at one stage while some of the women displayed their beadwork in a rondavel hut – when one of their mobiles went off in their pockets!. We cycled on through other villages, and rural hilly landscape, all on dirt roads – the poor guide struggling to keep up with us. I guess he hadn’t bargained on us being keen cyclists! On asking why all the rondavels are painted green, we were told that it is a limestone mixture, which gives a green hue. Free paint basically! We left Chintsa West that afternoon, northbound for Mdumbi, further north on the coast. After many tales of unsealed roads, potholes and general travelling nightmares, we expected the worst but for the most part the road was good, as we travelled through the high plateau. It was fairly desolate and far from anything resembling the comforts of our everyday life. However, when we turned off the N2 to get to Mdumbi and in the dark at this stage, things went a little downhill as the road appeared to fall apart at the seams. We had to weave our way down the road in the dark to avoid the many potholes – some of which would take several days to find our way out of if you got stuck in one! Following a local minibus was the only way to get through safely. The road got progressively worse, and eventually a bumpy mess of clay. It didn’t help that a heavy fog then rolled in, with all combined bringing us to a near standstill. The irony of it all was that every now and then there would be speed bumps to slow the traffic down! Finally we made it to Mdumbi village, relieved to have our car intact. 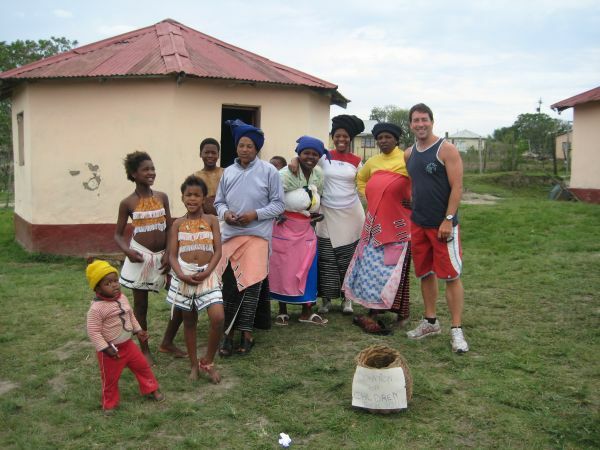 We stayed in a real Rondavel there – very authentic…! 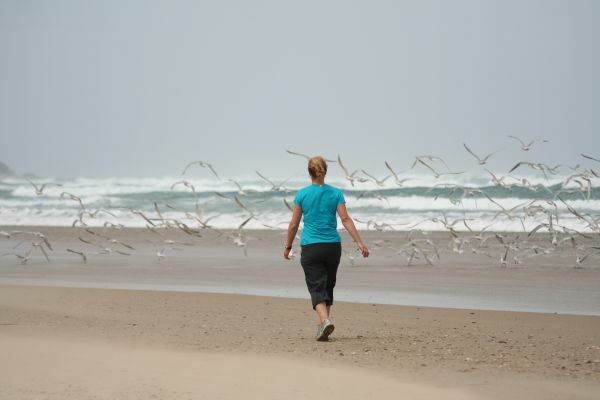 We explored the surroundings, enjoying a walk along the beach and cliffs to Umtata River mouth, via the Anchorage Hotel. We were greeted by a turkey squalking on the verandah. 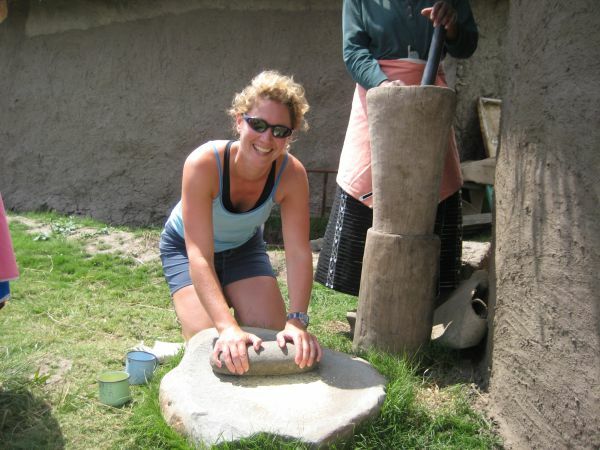 We hoped to get a proper coffee there, but what we got was African style – here’s the coffee, make your own! The manager there was very chatty and gave us the lowdown on the area. One shocking fact was that HIV is prevalent in an astonishing 70% of the local population and most people still live in ignorance/denial of the virus. Entire villages are being effectively struck down. 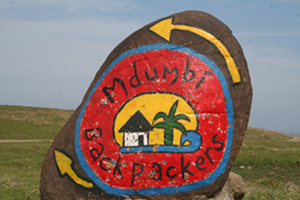 We decided that Mdumbi and the surroundings are like an African Mannin (some of you will be able to relate to this)! We carried on to Coffee Bay later that day – 20K along the coast from Mdumbi. 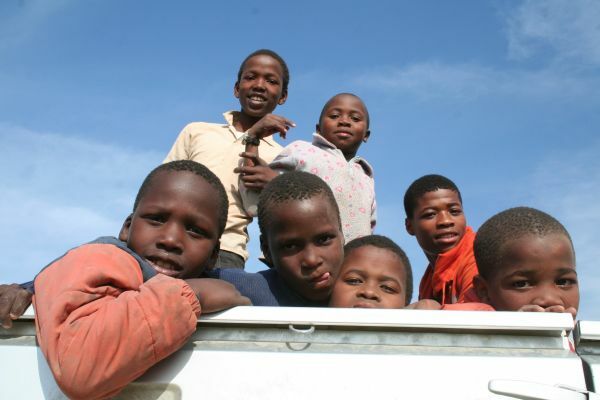 The drive over was stunning, that which Mandela had enjoyed as a boy – rounded hills, with villages of green Rondevals perched on the top and dense forest in the valleys. Cows, goats, sheep and pigs roamed everywhere. We met schoolchildren, girls carrying water from the well on their heads, kids playing in trucks…all keen to have photos taken and took great pleasure in seeing themselves on the digital screen. Cathal was in his element taking so many pictures – see below for yourselves! The “Coffee Shack” in Coffee Bay is legendary among backpackers…for partying and great trips. The bar runs “buffalo rules” (drink with your left hand or down your beer in one), a rather clever way of getting people drunk and spending more at the bar! Coffee Bay is not quite as stunning as Mdumbi, but certainly has its merits. Getting to our thatched cottage involved crossing a river from the main buildings – interesting in the dark and after a few beers ! We met some Irish lads there – Chris and Ben – travelling for 6 weeks by then and 3 photos taken between them. Chris told us how he had done a tandem parachute jump earlier in the trip. When you’re headed up to 10,000 feet, it’s not necessarily the time for jokes. That wasn’t their instructors view though. On the way up, he kept asking the lads – “So, you nervous?” Then he’d say, “Jeez, I am. Any of you ever do this before?” to which they said “No” and he’d reply”No, me either…”. Just you can just imagine the adrenaline levels of the boys hearing that just before jumping! We got down to the beach for an early surf on our first morning here…and then joined the other travellers for a walking trip, which included a visit to caves and some hairy cliff walking and jumping. 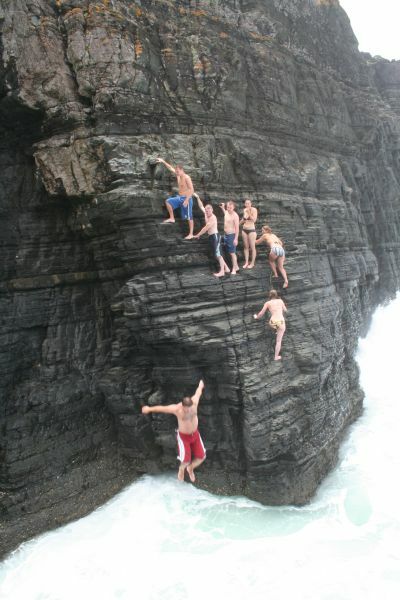 It was great, although only Cathal had the nerve for the cliff jump – the waves were pumping down below, everyone came back up the cliff scratched to bits! Our local guide Lindani was very informative and adventurous. 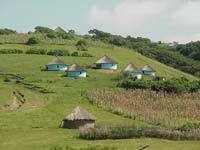 The Transkei, home to the Xhosa people, is the only part of the country still governed locally by tribal authorities and most of the region’s inhabitants maintain a traditional lifestyle. 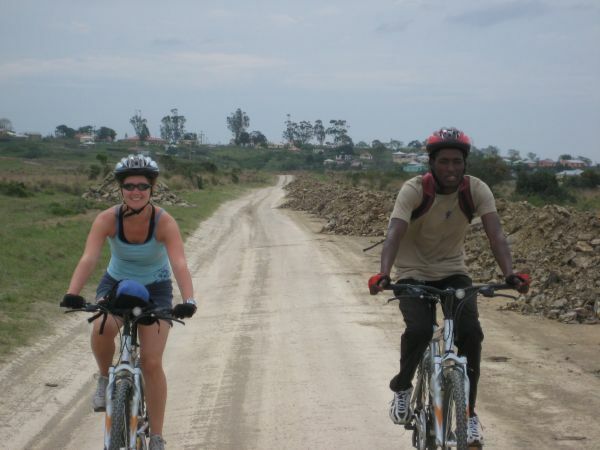 We felt that it feels like the “Real Africa” as we imagined it would be – huts dotting the hillsides. Personal wealth is still measured primarily by the number of cows someone owns and young men still undergo ritual circumcision at 18 to bring them into manhood. Typically, the thatched mud-brick huts are without running water or electricity. People still subsist on maize, mainly grown themselves.